Ireland's Eye? What an intriguing name. Ireland's Eye island is situated just 15 minutes by ferry boat from Howth Harbor outside of Dublin reminding us yet again that some of the most beautiful nature spots in Ireland are literally within commuting distance of Dublin. We make it a point to turn every day into a vacation (my husband is the blogger behind VacationCounts, after all). When we are home, this means exploring cool things to do outdoors in Dublin in and around our neighborhood (e.g., birdwatching on Bull Island or a hike on the River Dodder). We jumped at the chance on a sunny Sunday to make the day trip to Ireland's Eye island for a few hours of hiking and birdwatching in the shadow of Dublin City. Here's what we found on our Ireland's Eye ferry adventure. First, I have a public service announcement. We found out the hard way that there are actually two Ireland's Eye ferries. We thought there was only one and prebooked our places on the boat. The DART train arrived in Howth about 10 minutes before the ferry was scheduled to depart so we ran to the boat using Google Maps as our guide. We ran up to the dock as a ferry was sailing away. We waved frantically and the captain turned around to get us. It was only when we were halfway to Ireland's Eye and our phone started to ring that we thought 'uh oh'. The skipper of the ferry we were supposed to be on was calling. Turns out that we had inadvertently boarded the other ferry company's boat! The two companies making the trip to Ireland's Eye island are Island Ferries (orange boat) and Ireland's Eye Ferries (blue boat). They both make the boat trip to the Ireland's Eye about once an hour on a slightly offset schedule. SIDEWALK SAFARI SPOTLIGHT: Don't forget to make some time to see Dublin City. Check out our huge list of one day Dublin itineraries to keep you busy. We settled in for the ferry ride; the Irish sea was calm and the sun was shining. Within minutes, we were approaching The Stack, a huge vertical rock face on Ireland's Eye that is home to thousands of seabirds including gannets, guillemots, and puffins. We saw literally hundreds of birds darting to and fro around the rock and over the water. 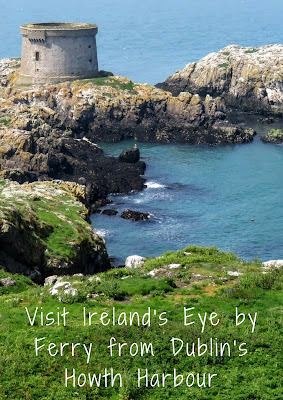 We rounded Ireland's Eye and pulled into a cove near a historic Martello tower perched on the rock face. We scrambled up a slippery rock staircase excited to see what we'd find in this wild uninhabited place. There are no set trails on Ireland's Eye which means it can be a bit slow going at times. Also, Ireland's Eye island is home to a variety of nesting bird species. We almost immediately stumbled upon an empty nest sitting on the ground. We soon learned that we were visiting Ireland's Eye during seagull breeding season. Watch out! There were dozens (if not hundreds of nests) and the seagulls were not happy to see us. If we accidentally strayed too close to a nest, a seagull would squawk and then zoom in scarily close to our heads. If that didn't invoke a retreat, things could get more serious. We heard cases of other hikers who were actually attacked by the seagulls on Ireland's Eye. We did our best to run the gauntlet of seagull nests on our walk around Ireland's Eye. Our target was to hike to the other side of the island to take a closer look at The Stack. We couldn't hike up and over the craggy rocks (too many seagulls). We found a path through a small valley and emerged in a grass meadow. Great, we thought... it will be an easy hike from here. That was until we started walking through the grass and found out that it was incredibly prickly and the nettles were stinging us through our thin trousers. We beat a hasty retreat to the other side of Ireland's Eye. We never did see The Stack from land but did find a most excellent vantage point for bird watching on Ireland's Eye not far from where our ferry landed. We were able to hike up fairly high and look down upon a rock simply covered in Guillemots. They are such beautiful and majestic birds. I've never seen so many! Training my camera a bit further out, I spotted a pair of birds off by themselves that looked a bit different. Turns out it was a pair of razorbills! These guys are so cool. I love the white accent lines on their plumage. Scanning the rock faces, we spotted nesting cormorants. We often see cormorants on the Dodder River in Dublin but our day trip to Ireland's Eye was the first time we'd ever seen a pair of them tending the nest. We spent a bit of time while waiting for the ferry boat to return for us exploring the area around Ireland's Eye island's Martello tower. We did this extremely carefully because the rocks were riddled with seagull nests. As were were moving away from an offended seagull, we spotted a path down to a quiet beach. We took the time to admire the crystal clear water lapping onto Ireland's Eye and looked back toward Howth Harbor. 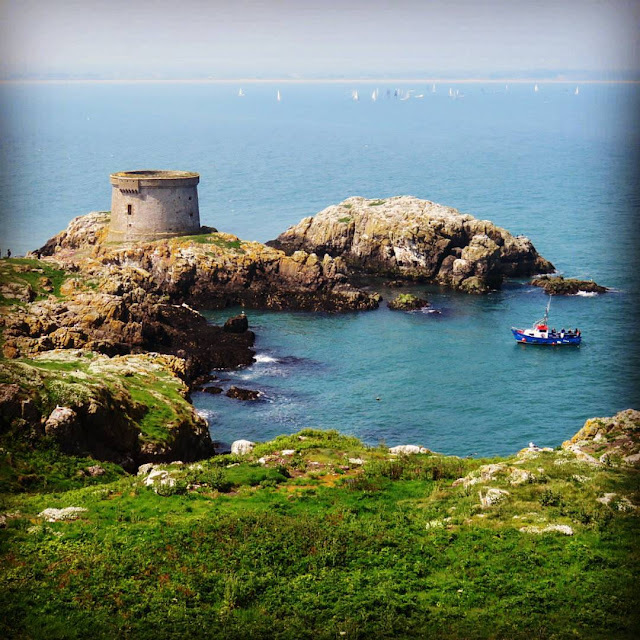 Even now, reflecting back, I'm still amazed at how easy it is to get to Ireland's Eye Island for a day trip; this world that is totally different yet still sits on Dublin's doorstep just 15 minutes off the coast of Howth. When we visited Ireland's Eye in late May, pink wildflowers and stunning yellow lichen meant that the island was simply awash in color. As we were waiting for the Island Ferries boat to pick us up, we spotted movement in the water just off the coast of Ireland's Eye a fair distance away. A seal soon popped its head above the waterline. We love birds (and apparently so do the seals...) and were excited to learn that there is other wildlife to be found in the waters surrounding Ireland's Eye. As we boarded the Island Ferries vessel on Ireland's Eye for the 15 minute return trip to Howth, we reflected on an amazing day out. I love that we were able to turn a simple outing close to home in Dublin into a spectacular 'vacation day'. Explore Ireland's Eye by ferry and sail to another world just 15 minutes off the coast of Howth in Dublin, Ireland for scenic hikes and fantastic birding. A photo-rich post written by Dublin-based travel blogger, Jennifer (aka Dr. J) from Sidewalk Safari.